Growing up my grandma (Hey Gram!) and grandpa lived three blocks away. I am lucky to have so many memories with them from sitting stopping by after dinner every few nights and spending time in our living room to spending weekends with them in Wisconsin. Almost every year my parents would take a week long vacation and a few weekend getaways where our grandparents would come watch us. I distinctly remember my grandma making two dinners each time she stayed with us – salmon patties and macaroni. We would request that she made them and now as an adult her macaroni has become one of my favorite comfort foods. I have never seen anyone make their macaroni like my grandma because she uses tomato sauce and cheese instead of making it extremely cheesy like traditional mac. 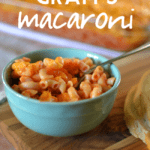 Not only is Gram’s macaroni comfortingly yummy it is also super easy and cheap. When my pocketbook is low or I am looking for a cheaper meatless meal to add to our meal lineup I always pencil Gram’s Macaroni in. My grandpa passed away when I was in high school but my grandma, who is now 81, visits us in Florida about once a year. She is such a vivacious woman – I hope I have the energy and adventurous spirit she does as I get older. I love that she gets to hold my babies and watch them grow up. This past fall when she came and stayed at my parents house for a week was when we were also living with my parents. 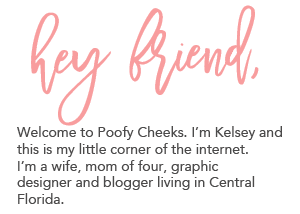 She got a real taste of the craziness that four kids bring. Boil the elbow macaroni according to the package directions. Drain the water and pour the macaroni into a 9x13 dish. Add the tomato sauce and cheddar cheese to the macaroni and stir gently to mix. Top the macaroni with the Colby cheese and put into a 350 degree oven. Bake for 20-25 minutes until the cheese on top is melted and starts to bubble. Here is the macaroni right before I put it in the oven. You can’t really see the shredded cheese at this point but once it bakes and melts mixing with the tomato sauce it is so delicious. Oh the cheese – and the noodles – with a side of bread or a salad – perfection! If you are trying to clear out your pantry you could always use a different kind of noodle (my husband likes the bow tie noodles better) or different cheeses. Bottom line – Gram’s Macaroni is muy delicioso!